Clifton Forge Reservoir is a 9 acre impoundment that serves as the water supply for the town of Clifton Forge. It is nestled in a gorge above the town and is surrounded by National Forest land. Although it is stocked with trout eight times a year, the lake is also provides good largemouth bass and channel catfish angling. Panfish are in short supply, but efforts are being made to reestablish sunfish stocks (see regulations for fishing hours, license requirements and limits). 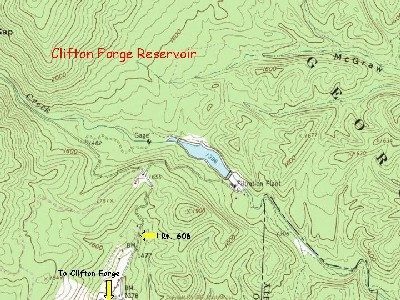 Take Route 606 from Clifton Forge, turn onto Reservoir Trail go to parking area. Catchable size rainbow trout are stocked eight times annually: twice in the fall, once in winter, and five times in the spring. Bank fishing for trout at Clifton Forge Reservoir usually entails the use of live bait (worms), or artificial bait such as salmon eggs, corn, or commercially made stink bait. Oddly enough, bluegill were not found in this lake prior to 2000. Bluegill are the most commonly found sunfish across Virginia, providing a food source for predators and an active sport fish for kids. Instead, the redbreast sunfish, typically a river dweller, is found instead. Redbreast sunfish are not found in large numbers or in great size. The other sunfish family member found in Clifton Forge Reservoir is the black crappie. Introduced by fishermen, black crappie are stunted in the lake. Because of a limited food supply and their ability to reproduce themselves out of house and home, black crappie in this lake are slow growing and small (6-10 inches long). Panfish can be best located near beaver lodges, fallen trees, and brush piles. Adult channel catfish were stocked by the Forest Service in 1997 to provide additional angling opportunities at Clifton Forge Reservoir. Additional stockings of channel catfish have taken place in 2002 and 2003. Channel catfish up to 20 inches have been sampled by DGIF biologists. Channel catfish can be taken in a manner similar to fishing for trout in the lake. Live bait, especially, nightcrawlers, are very effective in hooking up with a large catfish. From October 1 – June 15, one hour before sunrise to one hour after sunset. From June 16 – September 30, the lake can be fished 24 hours a day. For state residents, a license is required for those 16 years or older. For non-resident, or the 5-day trip license, a license is required for those 12 years and older. A trout license, in addition to the previously mentioned licenses, is required from October 1 – June 15 only. A National Forest permit is also required to fish the lake. A foot trail exists around most of the lake, with established bank fishing spots. Boating and swimming is not allowed. No concession stand is located next to the lake. Fish management options at Clifton Forge Reservoir are limited due to it’s use as a public water supply. DGIF plans to continue stocking trout at the current rate. Catchable channel catfish have been stocked on a regular basis since 2002. Finally, over 21,000 bluegill fingerlings and 3,700 redear sunfish fingerings were stocked in June 2001 to bolster the prey base and to provide alternative fishing opportunities.